The Northwest Coast region is a strip of land, less than 150 miles wide, that extends from the Alaskan Panhandle to present-day northern California. Mountains run the length of this land, which is broken up by numerous inlets and islands formed by offshore mountains. This temperate coastal area was so rich in natural resources that the development of agriculture was unnecessary. Six different linguistic groups existed within the Northwest Coast region. Fishing was the basis of their early economy. 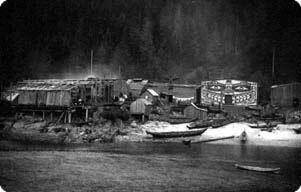 The Nootka people of Vancouver Island and British Columbia and their Makah neighbors to the south specialized in whaling. Farther North, the Haida and Kwakiutl (kwakeyUTl) people built their economy upon the abundant salmon, which could literally be picked from the water during spawning.